The South African national rugby team will have first class training facilities going into the 2015 Rugby World Cup after it was confirmed that their outdoor training camp will be based at Eastbourne College; where the excellent rugby pitches are maintained by a range of SISIS machinery. Dennis and SISIS have recently supported Bowls Scotland in a series of seminars held all over Scotland designed to help club greenkeepers and volunteers maintain their bowling greens. The recent purchase of a SISIS Brush-Pro ride-on brushing system and SISIS SSS1000 towed rotary brush sweeper by Nottingham Trent University (NTU) has helped to keep its sporting facilities in the highest possible standard; and one of just eleven UK Universities to have been awarded a Green Flag status. 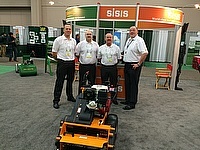 Following a successful appearance at last year's Australian Turfgrass Conference and Trade Exhibition, Dennis and SISIS has announced they will be returning to exhibit once again. Stephen Green, head groundsman at The Dixie Grammar School in Market Bosworth, Leicestershire, has his work cut out with four full-size natural turf pitches, a new synthetic pitch as well as a grass athletics track. However, his decision to purchase a new SSS1000 and Flexicombe from SISIS has made his job a whole lot easier. Andy Richards, Grounds Manager at Shrewsbury School, one of the country's leading independent schools, has recently purchased a new SISIS Rotorake TM1000 complete with a range of interchangeable reels to complete end of season renovations. Dennis and SISIS have successfully hosted another series of informative bowling green maintenance seminars with more promised for later this year. Over 200 cricket groundsmen made their way to Dennis and SISIS' cricket seminar hosted by St Albans School Trust where they refreshed their education on a variety of topics. Jason Cooper, Head Greenkeeper at Leamington & Country Golf Club, has chosen to purchase a SISIS Rotorake TM1000 scarifier and SISIS Variseeder 1300 tractor mounted seeder to help maintain the club's highly commended greens and tees. Visitors to booth 26052 at the Golf Industry Show (GIS) in San Antonio Texas in February can expect to see an impressive line-up of quality turf maintenance products from two of the leading names in the industry - on the combined stand of Dennis and SISIS. 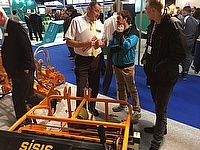 Dennis & SISIS have announced that they will be holding their popular cricket seminar on February 17th, where groundsmen in the sport will be able to refresh their education on a variety of topics. SISIS will be launching the new Flexi400 at BTME 2015 on stand A5, where greenkeepers and turf managers will have the opportunity to see just how beneficial this new piece of equipment will be. Dennis and SISIS, divisions of the Howardson Group, a leading British manufacturer of innovative world class turf maintenance equipment, has announced the promotion of both Toby Clarke as its new general manager and Roger Moore as new sales and marketing manager.